3rd-strike.com | 8-Bit Armies – Limited Edition launched today! 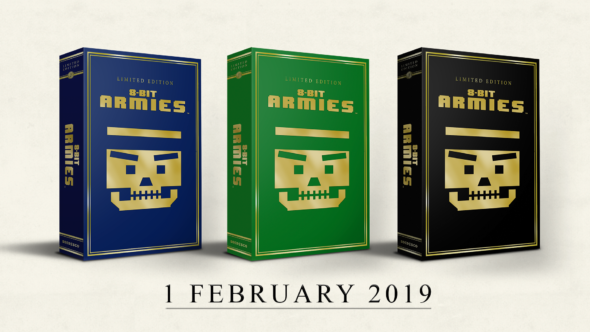 8-Bit Armies – Limited Edition launched today! Some special news today! 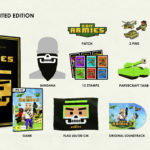 8-Bit Armies has gotten a limited edition! This will be SOEDESCO’s second limited edition with the first being the Owlboy Limited Edtion. The “Limited” in SOEDESCO’s Limited editions is quite literal as there will only be 6000 Limited Editions available worldwide. In the 8-Bit Armies: Limited Edition, there will be a lot of special collectors goodies. You will get the base game, a certificate, the soundtrack, the manual, a skull bandana, a flag, three pins, a patch, 12 stamps, a papercraft tank, and a dog tag. All the goodies have either a reference to the army or the 8-bit style of the game. Everything will be packed together in a premium box with gold printing. 8-Bit Armies is an RTS game with a modern military theme. Command giant armies of tanks, artillery, planes, snipers, super weapons and more. There are 40 single player missions, 12 co-op missions and online multiplayer so there are enough ways for you to turn your enemies to dust.